Brandi and Chris were married at the beautiful Diamond V Farm surrounded by the Blue Ridge Mountains on November 4th, 2018. Brandi was visiting Charlottesville with her friends when they stumbled upon our boutique on the Downtown Mall. They popped in to have a look around, but little did she know she would be finding her dream dress that day. As soon as she put it on she was all smiles. She later brought back her mother to verify it was the one, and fell in love all over again. Fast forward to just shy of a year later and she’s married to the love of her life. When I saw the photos I was amazed by what photographer, Amber Chesnut Photography, captured. I could see the pure love these two have for each other. And the way they look at each other will have you grinning from ear to ear. They have the kind of love that lasts a lifetime! Congratulations to McKenzie and Javier who were married this October at Rustic Pearl Barn in Stilwell, OK. The wedding donned all of our Fall favorites – plaid, pumpkins, rich hues, you name it! McKenzie looked stunning in her Justin Alexander gown and incredible flower crown. Wishing them both a lifetime of love and happiness! Our new “Camila” gown is lightweight, comfortable, and simply chic. We know our brides are going to love her ! Schedule your appointment to see her in person by clicking here! Congratulations to our Sealed With A Kiss bride Mary and her new husband KV! These two got married June 2, 2017 at the Stonewall Jackson Hotel in Staunton, Virginia. Mary chose a customized gown from Sincerity Bridal for her big day. She looked stunning in it! Congratulations to Nina and Alex! These were married on May 13, 2017. Nina first came to us back in 2016, while we were having a Paula Varsalona Bridal Trunk Show. Nina happened to see a spectacular ball gown in a floral print that was part of the trunk show, and was curious to see what it looked like, and gave it try. She unexpectedly fell in love with it! While she loved the look of the floral print, she preferred the classic white for her big day. The dress was absolutely perfect on her! She and Alex had a beautiful ceremony at Grace Estate Winery, surrounded by family and friends. With such a stunning bride, beautiful back drop and personal details throughout the decor, their wedding was perfection! Taylor and Aaron were married on May 13th at The Barn at Turkey Ridge. We are so glad that her wedding day has come, and that she and Aaron can begin their lives together. We know the future holds great things for these two! Ask Pat: When should I buy my wedding gown? Dear Pat: I did all my research and started dress shopping a year and half before my wedding date, to be sure I give myself plenty of time to look, and luckily I think I’ve found the perfect dress! It’s still more than a year until my wedding though, so it seemed a little too early to actually buy it–but my consultant said I really shouldn’t wait! What do you advise? Even though I’m sure that this dress is the “one,” I feel like I should wait a few months until I purchase it. As stylists, we here at Sealed With A Kiss can understand that it’s difficult to say yes to a dress so long before the actual wedding day, but in most cases the earlier you buy the better! Depending on the designer, dresses really do take anywhere from nine to six months to come in, but anything can happen–shipments get delayed, or it could arrive in the wrong size or color, and you’ll feel a lot better knowing that you have plenty of time before the wedding to deal with any issues that might come up. Designers also discontinue making designs quite frequently, and often without much notice–so it could be that the dress you’re in love with now will no longer be available to order if you wait a couple months. If you’re sure you love the dress, it’s best to get it as soon as you can! Have a question you want to ask a bridal stylist? Email your question to pat@sealedwithakissbridal.com, and we’ll be happy to help! Your question might even make it to the blog. We’re pleased to share these photos from our Sealed With A Kiss bride Ashley’s wedding! She tied the knot at King Family Vineyard on May 6, 2017. Doesn’t she look gorgeous in her Justin Alexander gown? Lindsey and Travis were married on May 7, 2017 at Cape Charles. Lindsey happened to come in for her appointment with us during our Paula Varsalona Bridal Trunk Show, and it was then that she fell in love with their sparkly soutache ball gown. The sample she tried had a deep v-neck, but she preferred the look of a strapless sweetheart neckline–we requested the change, and her gown was perfect! We loved working with Lindsey, and are so glad we had the opportunity to help her find her dream dress. 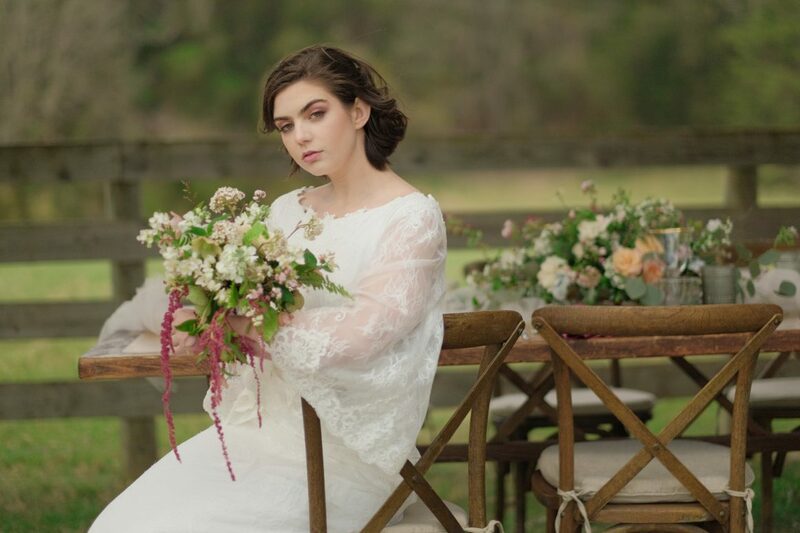 Some time ago local photographer Terri Isenhour approached us about participating in a styled shoot at Green Spring Plantation, and of course we jumped at the chance! Of course every vendor brought their a-game, and it was perfect. The shoot was even featured in Chic Vintage Brides!